Many Tibetans eagerly followed the Scottish independence referendum. Now the results are in and 55% of voters chose to stay with the U.K. We believe that this entire referendum process is a positive development for Tibet. The many parallels between Scotland and Tibet are striking. The Scots are a proud highland nation with a long history, like Tibetans. The Scots number 5.3 million, to 6 million Tibetans. The U.K. depends on Scotland for many of its natural resources like oil, while China exploits Tibet’s minerals and hydro resources. The British military stations all its nuclear weapons in Scotland, while the Chinese military considers Tibet an important strategic base. Many English have an emotional attachment to the idea of their country including Scotland, while many Han Chinese currently cannot conceive of their country without Tibet. The differences between Scotland and Tibet do not need stating: the Scots live in a democracy that respects human rights, Scotland has its own parliament and some autonomous powers, and no Scot has been sent to prison or tortured for nonviolently advocating independence or autonomy this century. 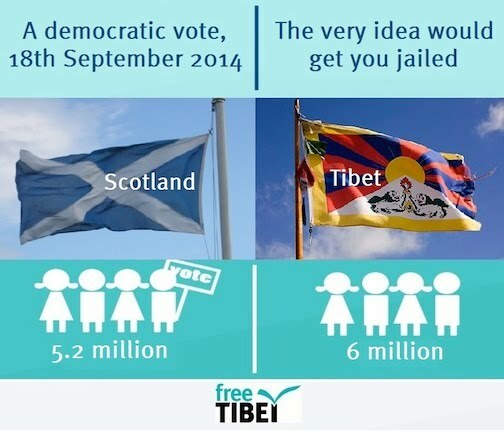 There are several reasons why the outcome of the Scottish referendum has been good for Tibet. The very fact that the British government ever agreed to respect the outcome of the Scottish referendum is a stunning example of the very best in democracy and self-determination. Simply put: the British government was prepared to let Scotland go, if the Scottish people wanted to. And the democratic decision-making process over this monumental question did not lead to instability; ultimately it may have even strengthened the British union. This is a shining example of how a civilized country respects the right to self-determination. Ultimately, it didn’t matter if “losing” Scotland would be economically, militarily, or emotionally hard for the U.K. That is because Scotland was not Britain’s to “lose” – Scotland belongs to the Scots, and it is their right to decide whether to stay or go. The rest of the U.K. can only try to convince the Scots to stay. Seemingly addressing the referendum -- and perhaps Beijing's propensity to quiet alleged separatists in western regions Tibet and Xinjiang with force -- one wrote pointedly, "there's nothing wrong with undertaking a referendum, without outside interference, to determine the future of a people." He applauded U.K. Prime Minister David Cameron's reliance on "persuasion, not mobilizing troops" as the only "civilized and respectable way" to maintain unity. Another user wondered aloud "why every time I hear about dissolution, it's outrageous, heinous, the end of the world. What's so wrong with splitting up?" One was indifferent to the vote's outcome, writing, "The fact that a people comprising one-third of the land mass of the existing country can vote on their own independence is already amazing." However, Chinese government’s outlook on issue is clear as Premier Li Keqiang told British Prime Minister David Cameron that China wanted to see a "strong, prosperous and united United Kingdom". Dali Yang, professor of political science at the University of Chicago, is quoted in South China Morning Post as saying: "From the Chinese official perspective, the People's Republic of China has never been kind to the idea of such referendums for Taiwan or anywhere else within what's considered Chinese territory." The Scottish referendum embodies the principle that the political ties that bind one people to another must be made through consent. Internally among the Scottish people, it was exciting to see the impassioned debate between those supporting independence and those who wanted to remain within the U.K. While some anti-independence politicians were accused of fear-mongering, on the whole the debate was carried out with democratic vigor. It was especially interesting to see the Scottish National Party’s detailed blueprints on its vision for what an independent Scotland would actually look like. 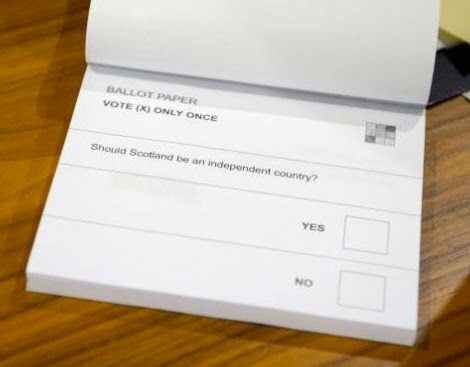 Interestingly, the referendum only had one question: “should Scotland be an independent country?” Prime Minister Cameron took a calculated risk in not allowing a choice for greater Scottish autonomy. At the last minute as it looked like “yes” might prevail, London promised Scotland greater autonomy if “no” won. This meant that a “no” vote could have either supported the status quo or greater autonomy. From a democratic perspective, this muddied the water a bit, and shows the importance of having any referendum’s questions be set out with integrity. The Scottish referendum also proves that a civilized country uses persuasion and incentives to convince a people to stay, rather than threats or military force. The three major U.K. political parties’ last-minute pledge promising greater devolution of power to the Scottish parliament very well could have decisively swung the tide of the vote to “no”. But this would not have happened if it didn’t look like “yes” was about to win. That is why Time Magazine declared that the Scottish “independence movement has lost the vote but won the argument.” Thanks to the independence movement, led by the Scottish National Party, the status quo will change. London will have to carry through on its desperate, last-minute promise to devolve greater powers to Scotland. The real winner in the Scottish referendum has not been the “yes” or “no” campaigns. The real winner has been the Scottish people. In exercising their right to self-determination, they (and they alone) have made their choice based on their own wishes and interests. One day surely the Tibetan people will do the same.